“The past is never dead. It’s not even past,” wrote William Faulkner. In Past and Present, an eminent American historian and cultural critic shows the truth of that statement. The common theme of the twenty essays gathered here is the often unexpected ways in which the past continues to illuminate the present. Gertrude Himmelfarb helps us find a new perspective on contemporary issues through a trenchant analysis of debates and thinkers from earlier times. She allows the past to inform the present, without distorting either past or present. 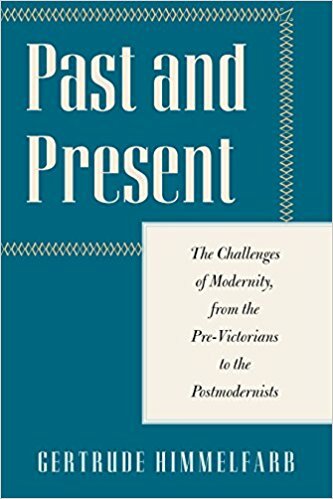 The topics of the essays vary widely, from the disorders of modern democracy to the challenges of postmodernism, from the Victorian ethos to the Jewish question. The thinkers examined range from Edmund Burke to Leo Strauss, from Cardinal Newman to Lionel Trilling. The political figures who appear here are also diverse, from Benjamin Disraeli to Winston Churchill, from the American founders to Queen Elizabeth II. Running through all the essays as a first premise is the conviction that the pursuit of knowledge and truth, however difficult or discomfiting, matters immensely in the “practical life,” to use Trilling’s terms, as it does in the “moral life.” Past and Present is a notable contribution to this endeavor?to understanding where we have been, where we are today, and where we may be (or should be) going.